It was a challenge, alright. After several false starts, I figured out that using a drill was the best way to go about putting wire in an ice cube. After I figured that out, the adventure really began. I think this is ice cube number seven or so. So great, down to the twisted use of Lifesavers as weights. Adorable! 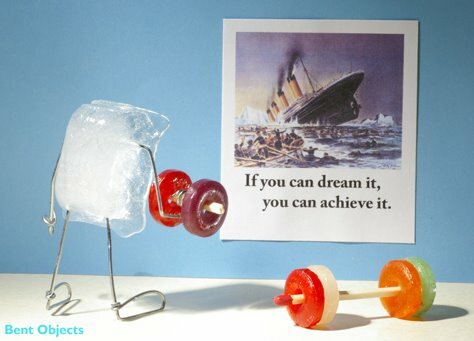 You can do it,ice cube! Never again will the big icebergs kick snow in my face.